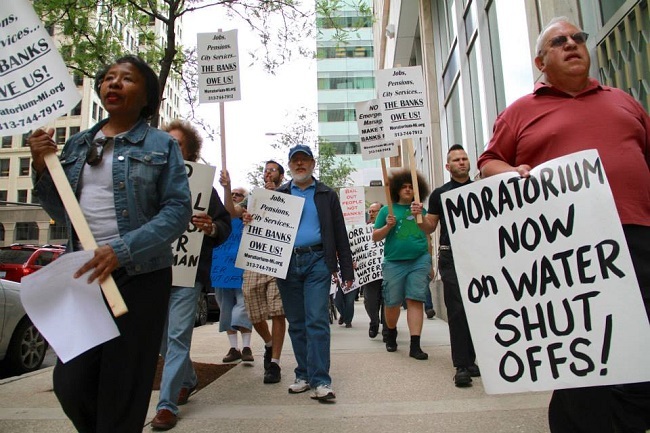 Demand an Immediate Moratorium on All Tax Foreclosures and Water Shutoffs! Demand NO Dumping of Poisonous Fracking Waste into Detroit’s Sewer System and Neighborhoods! We must demand that these funds be used to pay overdue property tax bills, so no families face eviction as a result of tax foreclosure. We must demand that these funds also be used to pay overdue water bills, so no families face water shut-offs, which are really an eviction. We must demand that US Ecology not be allowed to dump poisonous and radioactive industrial waste into Detroit’s sewer system and into Detroit neighborhoods. We must say no to environmental racism. The government intends on turning the Helping Hardest Hit Homeowner funds over to Gilbert’s “blight task force” to tear down homes rather than keep families in their homes as these funds are intended to do. Gilbert, the banks and the financial institutions caused the blight through their fraudulent and predatory mortgage practices. And the banks extorted $537 million from the water department to pay off interest rate swindles. Then the mass water shutoffs began. Demand the banks pay to remove the blight they caused! Demand the financial institutions repay the DWSD for their swap swindle, using the funds to set up an affordable rate plan!